It’s a brand new event but Stratford Autojumble offers the chance for a good old-fashioned rummage! This year, May 12 and September 15 are the dates to pencil into your diary for lazy Sundays browsing for bits and bobs – or maybe bolts and belts –for your unfinished automotive project. It’s just how Sundays should be! This is the ideal place for traders and visitors alike to meet and haggle over parts and spares. You can wander for hours, enjoying the friendly atmosphere and losing yourself in the jungle of jumble. Catering units will be on site, so grab yourself a cuppa and a bite to eat to satisfy those hunger pangs while you’re browsing at your leisure. 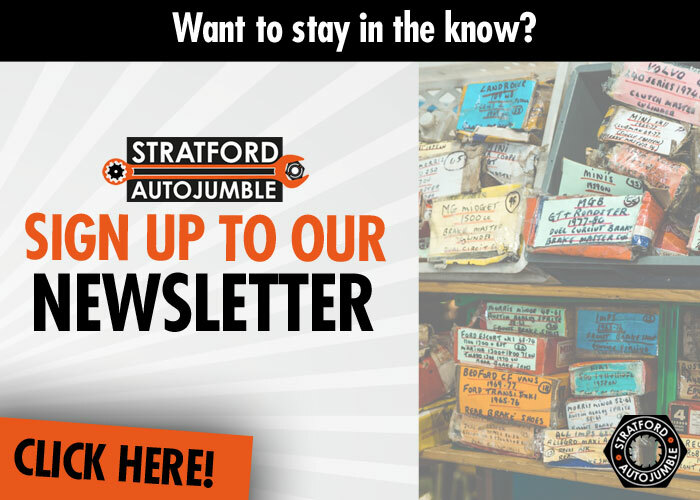 Sign up to receive regular email updates about the Stratford Autojumble.